San Sebastian’s center Ian Sangalang named MVP in the recently concluded Philippine Collegiate Champions League ( PCCL ). The six-foot-six Sangalang averaged a double-double in leading the Stags past the Ateneo Blue Eagles as the Recoletos-based squad became the first National Collegiate Athletic Association (NCAA) team to win the event. Sangalang is joined in the Mythical Team by teammate Calvin Abueva, Ateneo’s Greg Slaughter and Nico Salva, and University of Cebu’s Junmar Fajardo. 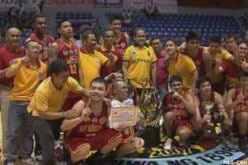 Stags coach Topex Robinson was named Coach of the Year, while the Best Performing Referee award went to Romy Mangibin. “The awardees deserve recognition for their outstanding achievements during the season-ending nationwide event,” PCCL executive director Joe Lipa said. The prizes were provided by Samahang Basketbol ng Pilipinas president Manny V. Pangilinan and ABS-CBN Sports. The Eagles settled for runner-up honors followed by San Beda College and University of Cebu. Also feted were North Central Luzon champion University of Northern Philippines, South Luzon-Bicol titlist University of Batangas, Visayas winner AMA and Mindanao titleholder STI. The San Sebastian Stags outlasts the UAAP Champions, Ateneo Blue Eagles to bag PCCL Title and the first NCAA team to win the title. The San Sebastian College Recoletos Golden Stags became the first team from the NCAA to win the Philippine Collegiate Champions League (PCCL), outlasting the defending champions Ateneo de Manila Blue Eagles 73-67 in the finals Thursday afternoon at The Arena in San Juan. The Stags, runners-up in the NCAA men’s basketball tournament, broke the game open in the second quarter and never relinquished the lead against the reigning UAAP champions. NCAA Season 87 most valuable player Calvin Abueva once again came through for San Sebastian, tallying 20 points, 17 rebounds, 3 assists and 3 blocks. Abueva took over the game in the last minutes, issuing two crucial assists to Michael Miranda and Jovit dela Cruz, who made baskets that gave the Stags enough of a cushion to withstand the Ateneo rally. San Sebastian prevented the Blue Eagles from taking their third straight PCCL championship despite being undermanned after losing star guard Ronald Pascual to an ACL injury. Ateneo actually came into the game with more momentum, after defeating the Stags in the first finals game to force the do-or-die contest. But the Stags were the sharper and more active team, especially on the defensive end, where they confounded the Blue Eagles with their zone. Moreover, Ateneo did not get anything from two of their primary scoring options, as both Kiefer Ravena and Nico Salva struggled mightily from the field. San Sebastian took control with a 13-3 run to open the second period, which gave them an 11-point lead, 30-19. The Blue Eagles could not recover from that run, despite the best efforts of Juami Tiongson, who scored 11 points in the third quarter to put Ateneo back in the game. The Eagles were able to bring the San Sebastian lead to as low as 5 points on numerous occasions in the final quarter, only to see Jonathan Semira, Anthony del Rio and Calvin Abueva make shots to put the Stags back in control. This is the first major title for the Stags this year after they fell to their rivals San Beda Red Lions in the NCAA. Before San Sebastian’s victory, UAAP teams dominated the PCCL, with the Blue Eagles winning the title in 3 of the last 4 seasons. Abueva, the NCAA MVP, added another feather to his cap after being named to the PCCL Mythical 5. Joining him is his teammate, Ian Sangalang, who was also named tournament MVP. Ateneo’s Salva and Greg Slaughter, as well as University of Cebu’s Junmar Fajardo, completed the Mythical team. Ateneo Blue Eagles and San Sebastian Stags will face each other in a knock out game in the PCCL finals. Two teams with contrasting fortunes in their respective mother league – UAAP four-peat champ Ateneo and NCAA bridesmaid San Sebastian – dispute the 2011 Philippine Collegiate Champions League ( PCCL ) diadem in a rubbermatch that will either cement the Eagles’ dynasty or give the Stags a redemption of sorts. Gametime is at 3:30 p.m. at the Arena with the Eagles out to put another feather in their cap by copping a third straight PCCL jewel and the Stags seeking to make up for a botched finish to an otherwise banner season in the NCAA by becoming the first national champions from their league. AdMU coach Norman Black and SSC counterpart Topex Robinson anticipate another struggle in today’s you-or-me showdown, which became necessary after the Eagles outlasted the twice-to-beat Stags last Monday, 56-51. “We just want to keep the game close and try to take advantage of every opportunity we can get,” said Robinson, still hunting for his first crown with SSC. The Stags look to hit pay dirt this time after settling for runner-up honors to San Beda despite a blazing 15-0 start in the last NCAA cage wars. Black said it’s important for his charges to find their shooting range against San Sebastian’s stifling zone. “They’ve done a great job on their zone defense, getting into the passing lane, cutting off our passing angles. I mean, you always gonna struggle if you don’t shoot well from the perimeter and we have not shot well in the last couple of games, actually,” said Black, ruing their 20-of-57 (35.1 percent) marksmanship and 26 errors. Firing blanks and turning the ball over, Ateneo went scoreless in the first six minutes of the fourth period and only scored one field goal, a jumper by Kiefer Ravena, in a 10-point final canto. Nico Salva, the top scorer with 18 points on 7-of-10 clip from the two-point area, made four of his six freebies in the stretch to bail AdMU out. “You know, as a coach, the game always becomes easier if you can make the outside shot and if you don’t, then everything becomes a struggle. On other side of the ball, you just have to forget about that and just concentrate on defense. In other words, if we can’t score, just make sure they don’t score,” Black said. Ateneo will also have to find a way to contain SSC ace Calvin Abueva. Black assigned Oping Sumalinog the last time around in place of shorter Kirk Long, but the reigning NCAA MVP still got away with 16 points (6-of-19 FGs) to go with 10 rebounds, three assists and one steal. Abueva’s stint was down to 27 minutes in the opener, hampered by leg problems and fouling out with 1:04 left after losing possession to Sumalinog and Long. Abueva bumped into the referee in protest, getting a technical foul that was later assessed to the SSC coach. Winner of the 2011 PCCL will take home the Manny V Pangilinan “Abutin ang Tagumpay” Perpetual Trophy that symbolizes collegiate cage supremacy. The Ateneo de Manila (AdMU) Blue Eagles showed championship poise and composure in defeating the San Sebastian Golden Stags, 56-51, to force a do-or-die game in the Finals of the 2011 Philippine Collegiate Champions League (PCCL). The Blue Eagles were steadier down the stretch of the close game, getting clutch performances from reigning Rookie of the Year Kiefer Ravena and Finals MVP Nico Salva. The Stags, who have a twice-to-beat advantage in the Finals, unraveled in the final moments, committing turnovers and failing to execute their offense. NCAA Season 87 Most Valuable Player Calvin Abueva compounded his team’s woes by getting thrown out just as the Stags were attempting a comeback. “I think our shots just didn’t fall in, but luckily for us, our defense kept us in the game,” Salva said afterwards. Much like their Final Four meeting, the game was highly physical and close all throughout, with the Stags and the Blue Eagles exchanging leads in the first half. San Sebastian took advantage of 16 turnovers by Ateneo in the first half alone, scoring easy fast-break points care of AJ Vitug and Jovit dela Cruz. But the Blue Eagles cleaned up their act in the third quarter and tightened their defense to take control of the ball game. “We made some adjustments and we were able to execute in the second half,” Salva said. Salva was at his best in the 3rd period, scoring 10 points on a variety of mid-range jumpers and hook shots. The Stags struck back in the fourth period, however, holding the Blue Eagles scoreless in the first six minutes while Abueva led San Sebastian to 9-0 run to take the lead, 48-46. Two free throws by Salva tied the game for the last time at 50-all, before Ravena made a turnaround fall-away jumper that gave the Blue Eagles the lead for good, 52-50. The game was still within reach for the Stags, but Abueva did not help his team’s cause when he committed his 5th foul with a little over a minute to go, and then got thrown out after shoving a referee. Abueva’s fouls allowed the Blue Eagles to ice the game from the free throw line, and force a deciding Game 2 on Thursday at The Arena. Another win by Ateneo on Thursday will give them their third straight PCCL championship, capping a highly successful year that also saw them win their 4th straight UAAP title. “It’s gonna be the last game for the year, so we want to come out on top,” Salva said after scoring 18 points to lead the Blue Eagles. But the Stags will surely want to do the same, as they have a chance to make history by being the first team from the NCAA to win the PCCL championship. The San Beda College Red Lions finished in third place in the 2011 Philippine Collegiate Champions League ( PCCL ), defeating the University of Cebu (UC) Webmasters, 82-69, at The Arena in San Juan on Monday. The Red Lions took numerous double-digit leads, especially in the second period, but they could not shake off the Webmasters until the latter part of the final quarter. After San Beda took another 10-point lead, 71-61, UC’s Quinton Heruela led his team to a 8-3 run to keep the Webmasters in the game, 74-69. But Rome dela Rosa scored on a lay-up, and Mar Villahermosa canned a 3-pointer with a little over a minute left that proved to be the dagger. In the end, the Webmasters could not keep up with the Red Lions’ guards, as dela Rosa, Villahermosa, Melo Lim and Baser Amer took turns leading the offensive charge for San Beda. Dela Rosa showed that he is ready to lead the Red Lions in Season 88 of the NCAA after another strong performance, finishing with 21 points on 9-of-14 shooting along with 7 rebounds. The Webmasters were able to keep the game close for much of the first half, and even took a brief lead in the second quarter after a put-back dunk by Junmar Fajardo. But their vaunted 3-point shooting, which led them to victory over the San Sebastian Stags, were off the whole game. Team captain Edward Pao, who had burned the Stags in their Final Four match-up, missed all five of his attempts from beyond the arc. Fajardo finished with 24 points and 24 rebounds, but received little help outside of Heruela. Ateneo de Manila University (AdMU) pummeled the undermanned San Beda, 76-63, to arrange a titular showdown against San Sebastian College-Recoletos (SSC-R) in the 2011 Philippine Collegiate Champions League (PCCL). Greg Slaughter led the Blue Eagles with 20 points on 9-of-14 field-goal shooting. The Blue Eagles now have a chance to redeem themselves from the 70-69 defeat they absorbed from the Stags last Tuesday. The Blue Eagles had no trouble manhandling the Red Lions, who missed the services of team captain Garvo Lanete due to shoulder injury. Ateneo, the back-to-back defending PCCL champion, led by 10 points on many occasions. Slaughter said they will make the necessary adjustments for their finals duel against San Sebastian. “They’re a tough team. We’ll play them on Monday so we have two days to prepare for that,” he said. The Stags won the first finals berth by defeating the Blue Eagles in the round robin Final Four. 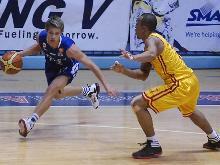 The victory gave San Sebastian a twice-to-beat advantage over their opponent. It will be the battle of champions as the Ateneo de Manila Blue Eagles and the San Beda Red Lions take on each other for the last slot in the finals of the 2011 Philippine Collegiate Champions League. Ateneo, the UAAP champions for the past four seasons, are coming off a heartbreaking 70-69 loss to the San Sebastian Golden Stags, who became the first team to clinch a finals berth. Meanwhile, the Red Lions will have the momentum going into the game after defeating the University of Cebu Webmasters, 83-77, to remain in the hunt for the last Finals berth. A win by the Red Lions will ensure that for the first time, the PCCL champions will come from the NCAA. “Since I’ve been here in San Beda, we haven’t beaten Ateneo, so for me that’s pride,” Red Lions guard Rome dela Rosa said after their win over the Webmasters. But the Blue Eagles, the back-to-back defending PCCL champions, will not give up the crown easily, especially after their 1-point loss to San Sebastian. Ateneo will once again rely on their big man Greg Slaughter, who is expected to test the defense of San Beda’s Dave Marcelo and Kyle Pascual. Meanwhile, Nico Salva and Kiefer Ravena will share the scoring load with their center, while dela Rosa will once again take the lead for the Red Lions. San Beda will continue to miss the services of team captain Garvo Lanete, who is out with a shoulder injury. The PCCL Finals will begin on Monday, with the Golden Stags possessing a twice-to-beat advantage over their opponent. The University of Cebu Webmasters finished their campaign in the 2011 Philippine Collegiate Champions League ( PCCL ) on a high note, defeating the San Sebastian Golden Stags, 92-71, at The Arena in San Juan Thursday. It was the Webmasters’ first win in the round-robin Final Four. They were blown out by the Ateneo Blue Eagles, 100-53, and faded late to lose to the San Beda Red Lions, 83-77. Meanwhile, it was a no-bearing game for the Stags, who have already clinched the first slot in the Finals along with the twice-to-beat advantage after defeating both Ateneo and San Beda in previous games. The Webmasters put on a 3-point shooting clinic as they made 16 3-pointers in the game, with team captain Edward Pao leading the way with 7 triples and Robinson Mohammad adding 6. “This is the kind of game kaya namin na-dominate ang Cebu,” said Gomez, who in his heydays in the PBA was a three-point sniper himself in nine years with Alaska and Pop Cola. The Stags were able to keep up with UC’s sniping in the second period through AJ Vitug, Kruschev Ferrer and Joshua Grilli, who all made shots from beyond the arc to keep things close. Big man Jun Mar Fajardo had 20 points, 12 rebounds and three blocks and finally found the presence of the supporting crew. However, the Webmasters continued their hot shooting in the second half, while the Stags found it difficult to produce points with their best players, Calvin Abueva and Ian Sangalang, sitting on the bench. “Naglaro kami ng may focus at fluid ‘yung opensa. Siguro, tinake din kami ng San Sebastian lightly pero ito ‘yung game na nag-step up talaga sila lahat kasi mahirap ‘yung konti lang ang naglalaro,” said Gomez. “Ang sikreto lang namin, 300 shots per day or more dahil habit kasi yan eh. Para sa akin, lahat ng shooters, dapat visualize lang and establish ‘yung footing, pagtingin sa ring, tira na,” Gomez said. UC completely pulled away late in the third after Pao canned back-to-back trifectas to give the Webmasters their first double-digit lead, 67-57. “We want to play hard, play serious and show the Manila teams that we Cebu teams can play with them,” he added. Pao finished the game with 25 points (7-of-12 from behind the arc), 8 rebounds, 3 assists and 4 steals. The Stags will find out who they face in the Finals on Friday. The Red Lions and the Blue Eagles face each other for the second Finals berth. The University of Cebu Webmasters took on the personality of its head coach Roel Gomez to claim their first win the PCCL National Championships semifinal round. Meanwhile, Far Eastern University-Nicanor Reyes Educational Foundation defeated La Salle Greenhills, 85-77, in a charity game. A shorthanded San Beda Red Lions squad defeated University of Cebu, 83-77, Tuesday to keep the NCAA champions’ finals hope alive in the PCCL National Championship at the Fil Oil-Flying V Arena in San Juan. With their top players not in uniform for various reasons, Rome Dela Rosa, Mar Villahermosa and Baser Amer picked up the slack for the Red Lions against the Webmasters. The Red Lions are playing with only 10 players with top scorer Garvo Lanete still nursing a shoulder injury and Jake Pascual still in the hospital recovering from a bum stomach. UC was in contention for the most part as it only trailed by one point, 57-56, at the end of the third quarter, before San Beda pulled away in the final period. Dela Rosa notched 11 of his 25 points in the fourth quarter. With just a three-point lead for San Beda, Amer and Villahermosa, a Cebu native who was part of the University of San Jose Recoletos squad, combined for the final nine points of the game for the Red Lions. Dela Rosa, Villahermosa and Amer also combined for nine of San Beda’s 12 three-pointers in the game. San Beda overcame a 24-point, 14-rebound effort by UC’s big man Junmar Fajardo. San Beda faces Ateneo on Friday with the winner facing San Sebastian in the finals. The Webmasters, the Southern Islands champion of the tournament, are now out of contention for a finals seat and will face San Sebastian on Thursday. San Sebastian College held Ateneo to only one field goal in the last six minutes of the game, as the Stags defeated the UAAP champion and defending titlist Blue Eagles, 70-69, Tuesday in the Philippine Collegiate Champions League national championship at the Fil Oil-Flying V Arena in San Juan. The win assured the Stags, the runners-up in the Season 87 NCAA basketball tilt, a twice-to-beat advantage in the finals of the tournament. San Sebastian clinched the finals incentive after claiming its second win in the round-robin semifinal tournament following its 87-72 win over NCAA champion San Beda Monday. The Stags turned to Calvin Abueva and Ian Sangalang in the final moments of the game. The duo scored seven of the team’s last nine points to overhaul a 65-53 deficit with 6:06 to play and escape with the win. “I told them to take this opportunity of trying our luck against the number one collegiate team in the country,” said San Sebastian coach Topex Robinson. Abueva had 20 points and 11 rebounds while Sangalang added 18 points and six rebounds for the Stags. Ateneo uncharacteristically fell into a long drought late in the game and San Sebastian took advantage. Abueva knocked in a running shot for a three-point play before giving the Stags a 66-65 lead with a lay-up with 1:50 left in the game. Greg Slaughter tied the game after splitting his free throws, but Abueva issued a drop pass to Sangalang for a short stab that pushed the lead to 68-66 with 54 seconds remaining. Jovit Dela Cruz increased the Stags lead to four points, 70-66, on two free throws with 10.8 seconds left. But Ateneo cut the deficit to one point on a three-pointer by Kirk Long with 6.2 seconds on the clock. After Sangalang missed two free throws with 4.6 seconds left, Long banked in a three-pointer to end the game. But the shot was nullified after a video review showed that the shot was hoisted after the buzzer. “We played every possession, made good defense and didn’t force our shots. We valued our every possession,” said Robinson on his team’s comeback. Slaughter was even called for an unsportsmanlike foul for elbowing Michael Miranda at the 3:27 mark of the fourth quarter. Slaughter had 16 points, seven rebounds and two blocks, Nico Salva had 13 markers and Kiefer Ravena added 12 for Ateneo. The Stags missed the services of Ronald Pascual, who sustained a tear on his left ACL against the Red Lions. It is his second ACL injury after his right knee got injured during his high school days in Adamson. “We are seeking a second opinion but he still has time to recover in time for the NCAA season,” said Robinson.